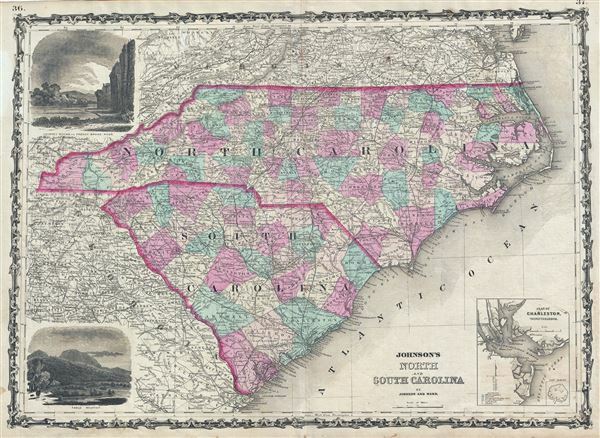 This is a beautiful example of A. J. Johnson and Ward's 1863 map of North Carolina and South Carolina. It offers a fascinating snapshot of these states during the American Civil War. Map shows both states in full with color coding according to county. An inset map in the lower right hand quadrant depicts the city and harbor of Charleston. Throughout, Johnson identifies various cities, towns, rivers and assortment of additional topographical details. Engraved views depicting the 'Chimney Rocks and French Broad River' and 'Table Mountain' decorate the upper left and lower left hand quadrants, respectively. Features the strapwork style border common to Johnson's atlas work from 1860 to 1863. Published by A. J. Johnson and Ward as plate nos. 36-37 in the scarce 1863 edition of Johnson's Family Atlas. This is the second edition of Johnson's atlas to bear the 'Johnson and Ward' imprint. Rumsey 0352.028 (1864 edition). Phillips (Atlases) 6140, 26-67. University of North Carolina at Chapel Hill, Map Collection, Cm912 1863j. Library of Congress, Geography and Map Division, G3900 1861 .J6 TIL.